Central Scotland’s finest wedding and events band, providing a well-renowned quality service and full entertainment package for your big day or special event. 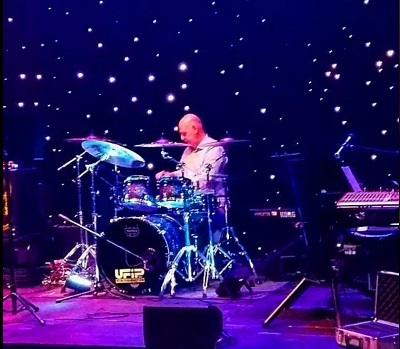 With years of experience performing at weddings, parties, corporate events and numerous other functions, The Band know how to fill a dance floor. We strive to provide the best quality show and concert experience, catering to all ages and tastes to create a fantastic party environment. you’ll be guaranteed the highest quality music performance with a set list of classic party favourites and current chart-toppers. We just wanted to say a huge thank you to you all. What a wonderful day we had from start to finish. I hope your voice has recovered – to say nothing of the huge amount of energy you put into your performance, John. Vicki and Jeff knew right from the start of planning that they wanted the band to play and they couldn’t have made a better choice. The minute you started the first dance the dance floor was never empty! So many people commented on the fact that you guys are more than “just a band” you are an entertainment. Thanks again and we hope we will be lucky enough to hear you all again soon. You had the dance floor packed all evening it was superb, also thank you for allowing Mark to sing for our first dance and thank you for learning Time of Your Life for our last dance that was fantastic. A big thank you for playing at our wedding at the Gilvenbank Hotel. You made our reception a brilliant night and everyone thought you were great!